The original waterfall is born in the ravine Rivanceras, which is in a narrow ravine and is more than 8 meters high, access to this is very difficult and dangerous, but this waterfall is followed by another that has been a construction of the 60s and that had the function of retaining the waters of the boiler. Thus, as the waters that flow have mineral elements, they have generated or stained ocher and reddish colors the stone walls. The Caldera de Taburiente National Park is one of the biggest attractions of the island of La Palma. This eight-kilometer-diameter slit, covered with forests and dotted with deep ravines, keeps a jewel inside: the Cascade of Colors. It is a semi-natural waterfall located in the Barranco de las Angustias, in a bend of the Rivanceras ravine. To contemplate this wall, painted naturally in green, yellow and orange colors, fruit of iron dissolved in the waters of the ravine, with the water oozing all year round, is a real spectacle. In the Caldera de Taburiente National Park there are taxi drivers that take you from the Barranco de las Angustias (where you can leave your car) to Los Brecitos (where you can not park vehicles). 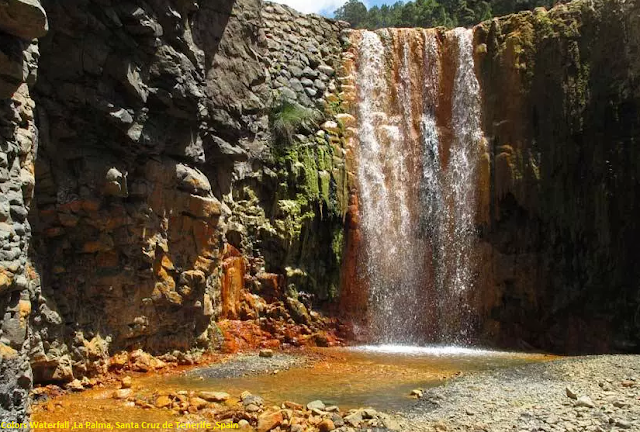 From here you can start a walk of 18 km that runs through the park and access to the Cascada de Colores.